Discussion in 'Outerwear' started by Gamma68, Mar 26, 2019. Not sure where to post this, but sometimes conversations about jeans pop up in the outerwear forum. I bought some vintage-styled selvedge raw denim jeans (model A1-28) from the sadly defunct Circle A Brand out of Asheville, NC. This model has a cinch back and buttons to accommodate suspenders. I still need to soak these and let them shrink to fit, but the weather needs to warm up before I wear wet denim. I'll probably wear a belt with these most of the time, but like the idea of wearing with suspenders sans belt occasionally. What would be an authentically styled pair of suspenders to go with these jeans? 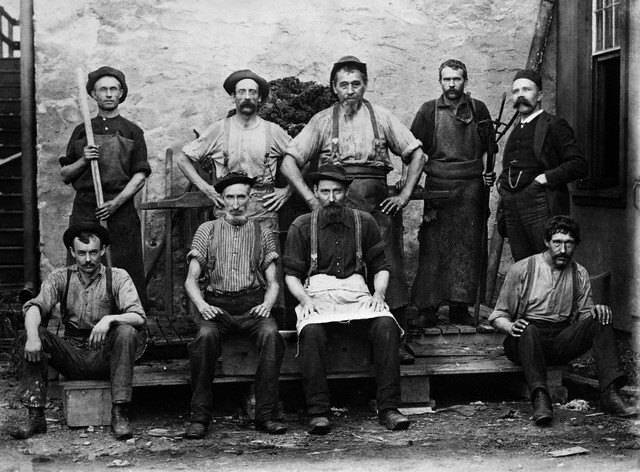 I'm having trouble finding vintage images to see what kind of suspenders men wore with their denim. Also, what material would be authentic? Who's selling what I'm seeking? Circle A is gone but a kickstarter video they posted is still online. Some good looking suspenders appear in the footage. It's nice that they aren't indigo. Dunno but i like the idea and the video. Some of the suspenders from the links above might work. Striped ones aren't as appealing to me. Don't want to call too much attention to them. Also, something available in the USA would be preferable. Found this photo from the S.F. 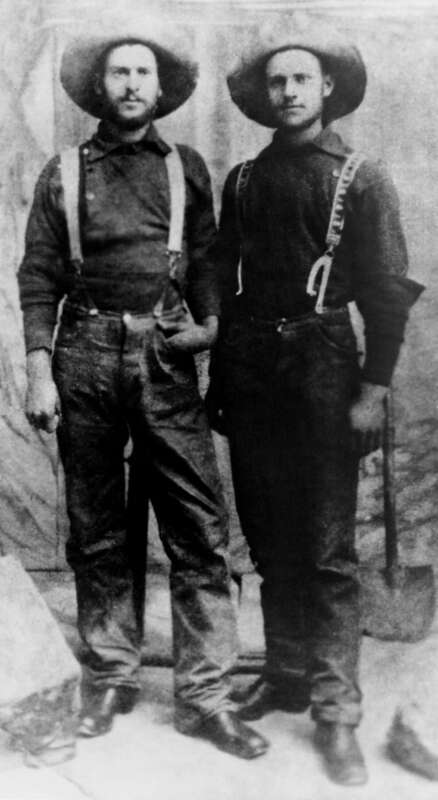 Chronicle of 1890s miners wearing Levi's. Even with suspenders these pairs appear to have a high rise. I bought a few of these to go with mine. I like these because they are not elastic. RRL has lots of suspenders you can find on ebay. Filson and Carhatts also have. Thanks for all the links. Some of the RRL ones look great but damn are they expensive. The River Junction suspenders look to be of quality and are the most affordable but I'm not sure about the non-traditional shape of the leather ends. I'll check out Carhartt and Filson. River Junction have other types but I actually like the non-elastic ones cos they look Old West. Which pike did you go with. They don’t provide quite as much measurement detail as some other retailers. I’d like to try the look but am a little apprehensive about ordering/shipping. 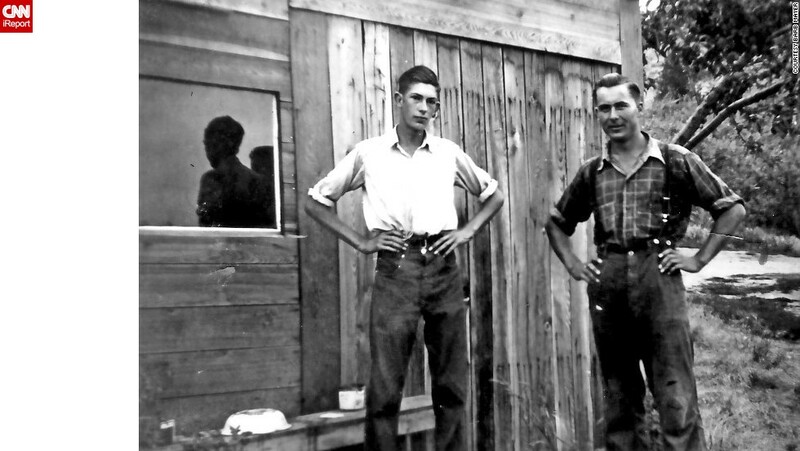 Purchased early cinch back denims, duck canvas Hunting pants & Engineer pants (early chinos), purchased the 'regular' 1937 'Blue' braces to hold the above up in the abscence of a belt. Measurements as you say aren't the most detailed..waist & leg generally. I've been buying from Pike for the last 5 years & have yet to be disappointed at any level. I get stopped in the street sometimes by Folk asking where my pants came from. I've also purchased Pike vests, belts & lanyards. 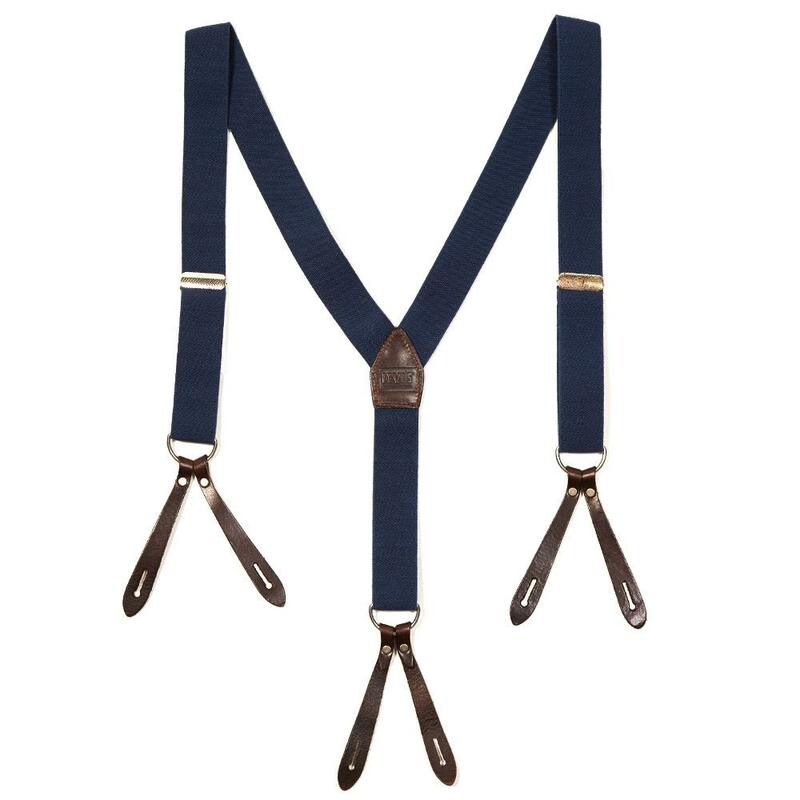 Update: I bought these new CTM canvas suspenders on eBay. They arrived yesterday and are perfect. It's a quality item for less than $20 including shipping. Recommended.